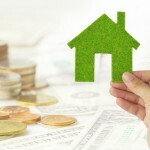 Saving Energy Saves You Money! Make a commitment to saving money this year by saving energy. It’s easy! Making simple, everyday changes saves energy and money, while protecting the environment. Use a programmable thermostat. You can save about $180 a year when a programmable thermostat is used and set properly to adjust temperatures when you are away from home or sleeping. Conserve hot water. 14-25 percent of your energy bill each month comes from heating water. Simply lowering the temperature of your water heater to 120 degrees reduces these costs as well as reduces the risk of scalding injuries. During a 10-minute shower using a low-flow shower head saves up to $145 each year, compared to a bath or old-fashioned showerhead. Maintain your cooling (and heating) system. Each month half of your energy budget goes towards cooling (or heating) your home. Regularly changing or cleaning your air filters increases efficiency. And make sure to have your system maintained annually by a qualified technician. Switch to Compact Fluorescent Light Bulbs (CFLs). CFL bulbs initially cost a bit more, but switching saves about $6 a year in electric costs and more than $40 over its lifetime! And a CFL lasts about 10 times longer than a standard bulb. Dust can cut light output by as much as 25 percent, so keep them clean! Bonus Lighting tip: The outdoor porch or post lamp is one of the most used lights in any home, install a CFL bulb for maximum savings. Also consider installing a motion sensor that turns on the light only at night or when someone is present. Stop energy leaks. A major waste of energy in your home results from air leaks. Stop these leaks by using spray foam or caulk to seal holes around spots where plumbing, wiring, vents and lights come through walls, ceilings and floors. Also close fireplace dampers and use weather-stripping around doors, windows, and attic. Utilize ceiling fans. Most ceiling fans have the ability to reverse the motor, therefore, the airflow. During the winter, as heat rises and collects near the ceiling, set the fan for upward airflow (clockwise) to force this trapped warm air back down into your living spaces. In the summer, whereas you only use a ceiling fan when people are actually in the room to cool, fans can remain on in the winter to recirculate hot air around the room. In summer, the fan needs to blow air downward. By utilizing fans in the summer, you can lower the thermostat by only two degrees and reduce air conditioning costs by up to 14 percent! Retire that old refrigerator! If you have an old refrigerator in the basement, it’s probably costing you a lot to run each year. Chances are it’s only housing some extra drinks and maybe some leftovers. Refrigerators and freezers run more efficiently when full, so reorganize your main one and get rid of the old one, which is only taking up space and wasting energy anyway. Wash full loads. You can save energy by always operating the dishwasher and clothes washer when they are fully loaded. “Washing full loads of clothes can save more than 3,400 gallons of water each year,” according to NJNG. “And since hot water accounts for about 90 percent of the energy used to wash clothes, switching to cold water can save the average household up to $40 per year.” Also if you’re ready to replace your old clothes washer, ENERGY STAR models reduce energy use by over 35 percent and water consumption by over 50 percent. Rinsing dirty dishes prior to loading them into the dishwasher wastes water and energy. Most new models do not require a pre-rinse – just scrape off excess food instead. Always use the air-dry option. Replacing an old, standard dishwasher with an ENERGY STAR model will save you enough money to pay for dishwasher detergent all year long!